You may think only wet sprinkler systems, ones with water filled throughout the entire fire sprinkler system, can be susceptible to interior corrosion from the water supply. In fact both wet and dry fire sprinkler systems can suffer corrosion from the inside out, causing pinhole leaks, sludge, clogged sprinkler heads, reduced water flow and repeating costly pipe replacement every few years. Let’s take a look at the cause, it’s the combination of metal, water (moisture) and oxygen that come together to cause electrochemical and galvanic corrosion. Furthermore, any water supply may have bacteria (living organisms) that speed the corrosion process, and that can be detrimental to fire sprinkler systems. The industry refers to this type of problem as Microbiological Influenced Corrosion (MIC). What is MIC, Electrochemical and Galvanic Corrosion? MIC Corrosion – Many areas of the country have higher levels of Microbiological life forms naturally in the water supply. The Northern Illinois area around Lake Michigan is one of those areas. Here are the three main groups of bacteria species that cause MIC. Acid Producing Bacteria (APB) produce acids as a waste product. 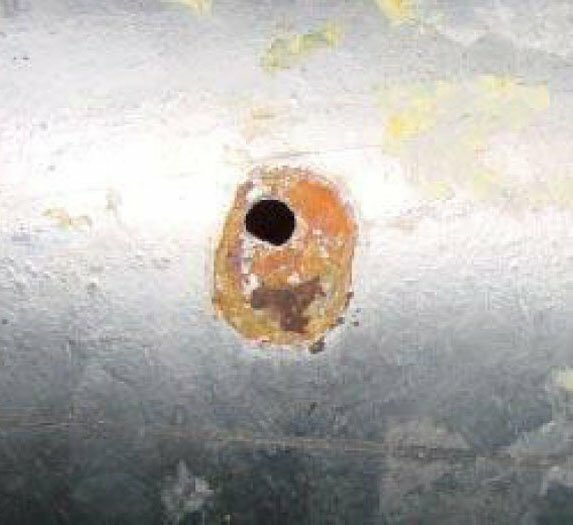 The created acid is very corrosive to metallic surfaces. Sulfur Reducing Bacteria (SRB) react with iron on metallic surfaces to form iron sulfide and hydrogen sulfide gas as waste products. These gases form sulfuric acid and create pitting in metallic surfaces. Iron Related Bacteria (IRB) derive their energy from oxidizing or reducing iron. Their corrosion process is more general on metallic surfaces. Electrochemical Corrosion – Occurs when there is moisture and oxygen present with metal. Electrons form atoms at the surface of the metal and transfer to a suitable electron acceptor or depolarizer causing corrosion. Galvanic Corrosion – Occurs when two electrochemically different metals exist within a localized environment. Ions move from one metal to another, causing one of the metals to corrode. If my Fire Sprinkler System is Dry, how can it have corrosion? It’s easy to understand water in a wet fire sprinkler system causing corrosion, but if a fire sprinkler system is dry, how can corrosion happen? It’s true that Dry and Pre-action (a two-step process for activation) fire sprinkler systems are not filled with water under pressure, ready to disperse water immediately upon activation. Dry and Pre-action Systems are systems in which the piping is filled with pressurized air. This air holds a dry valve at the water source in the closed position until activation. Once activation occurs, pressurized air is released, allowing the dry valve to open and water to flow through the system to the activation point. The constant presence of oxygen (compressed air) in the dry system which contains residual water from condensation caused by atmospheric temperature changes, and remaining water from required hydro-testing and flow testing set the stage for corrosion. Simply, a dry fire sprinkler system is never really dry. Even regular required draining of low point valves to let the residual water out of the system won’t leave the system totally dry, as condensation build up is always a factor. The buildup of internal corrosion not only causes pinhole leaks in fire sprinkler systems, it can also compromise the function of the system and leave it inoperable during a fire. Internal corrosion can block or reduce the flow of water in the system and may lead to loss of life and property. In dry systems a pinhole leak releases compressed air, causing the auxiliary air compressor to run continually to try to keep up the air pressure in the system. How do I protect my Fire Sprinkler System from corrosion damage? 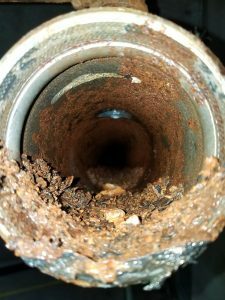 Even if your fire sprinkler pipes look perfectly fine on the outside, corrosion could be actively compromising the inside of your pipes. The next time your fire sprinkler system is serviced, ask for a corrosion analysis and water test. Identifying the type and severity of a corrosion problem is the first step in finding the best way to protect your fire sprinkler system. For wet or dry fire sprinkler systems alike, the introduction of high purity Nitrogen into the system is the answer. It’s important to understand the science behind corrosion and noting that Nitrogen solutions will not reverse corrosion, but rather arrest it. Ideally, any new sprinkler system will have the best life longevity if it’s protected with a Nitrogen solution. 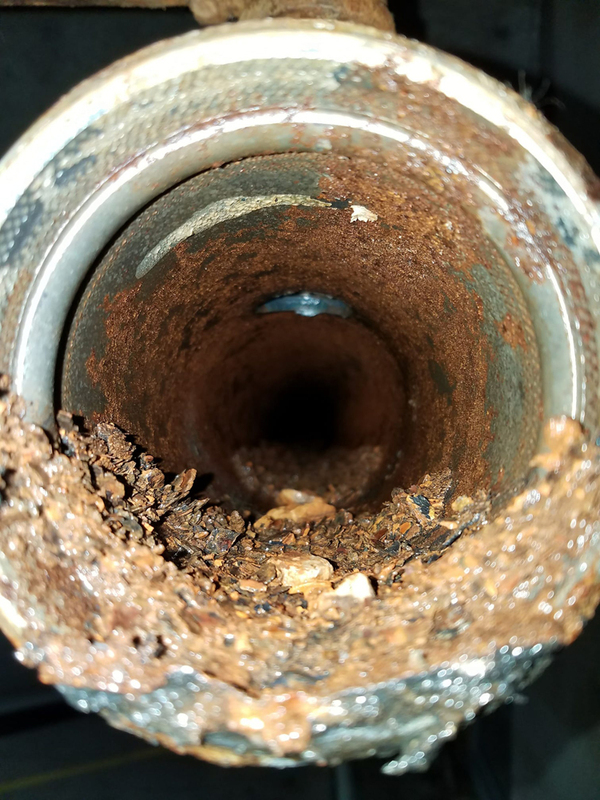 Any sprinkler system that has had piping replaced due to pinhole leaks, excessive corrosion or sludge buildup, will benefit from a properly maintained Nitrogen solution that arrests corrosion, meaning any existing corrosion will not worsen.